From the Von Trapp family to the Cowsills, The Osmonds, Jackson Five, The Bee Gees, and the Wilson sisters of Heart, and Tegan and Sara, it seems that families have been making music together since the beginning of time. 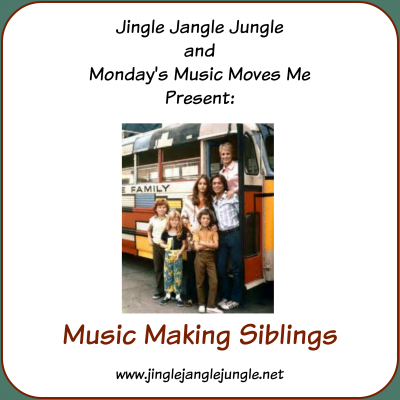 Today, with the help of Monday’s Music Moves Me (#4M), we are taking a look at a few musical groups with siblings. It’s the birthday of X-Mas Dolly’s brother today, so our theme is to celebrate siblings. I tend to get carried away with the themes. I’m trying hard to not overindulge here. I wanted to share with you all some music from those that you may not be as aware of as siblings. Of course, in the playlist, I’ll include the more familiar groups. Devo has not only one set of siblings, but two sets of siblings. Mark and Bob Mothersbaugh, and Gerald and Bob Casale. The Statler Brothers - only two brothers in this group, Don and Harold Reid. No one in the band was named Statler. The Ramones - Each of the band members took on the last name of Ramone, but no one was related to each other. Thompson Twins - Despite the name of the group, this group did not have any twins, nor any siblings. The band was named after the two bumbling detectives Thomson and Thompson in Hergé's comic strip The Adventures of Tintin. Know of any siblings that I may have left out of the playlist? Let me know in the comments and I'll add them! The Gatlin Brothers. Well, actually lots in country music. The Beach Boys. Fun post! I had the Beach Boys in the playlist, but I've now added The Gatlin Brothers. Thanks Barbara for the suggestion! Let's see. The Everly Brothers, who are brothers. The White Stripes, who are not brother and sister. How could I not have known about the Kinks? Good choices, and you are correct the White Stripes are not related, although they presented themselves as brother and sister. Thanks for stopping by, Alana! Wonderful twist for today's theme! I love your creativity to honor artists/bands siblings. Great to hit the dance floor with ya this morning. Have a tunetastic week! I can't wait to see what you guys have up your sleeves next! This is a great angle for the topic. I never thought of sibling bands. Also, I'm surprised I never thought of We are Family because we always dance to that one as a group at big family events. Fun post! Happy Monday. Also, I never thought of anything but Whip It when it comes to Devol. This was certainly a fun topic to put together. Thanks for dropping by to have a listen! I love your take on it. Thanks for it. Great songs. It was really enjoyable thinking about all those siblings. ooh, excellent choices! I'll be sure to get them added to the playlist. You're right, there really are quite a few siblings in the music biz. It's easy to forget. I knew about all of these except Devo. I actually had no idea they were siblings (well, two pairs of them). How about Milli Vanilli? No wait, they weren't brothers. They weren't even singers. Ha! But I bet if Milli Vanilli were around today, they would be honored as much as some of these other newcomers to the game. Sure, they lip syncd and used session musicians, but isn't that the norm for the new kids these days? Ooh, check out the Joseph sisters. As for Devo, I had no idea! But I do know that Kings of Leon honored their Grandpa Leon. ~grin~ And while the guys in The Lumineers aren't siblings, the founders shared a connection. Paraphrased from Wikipedia: Growing up in Ramsey, NJ, Wesley Schultz's best friend was Josh Fraites. Fraites died of a drug overdose in 2002, at the age of 19. In the wake of Josh's death, Schultz connected with Josh's younger brother Jeremiah Fraites, a drummer, and the two "found solace in music, writing songs and playing gigs around New York." The two toured under the name Wesley Jeremiah, and released a self-titled EP (including future The Lumineers songs, "Flowers In Your Hair" and "Darlene." Hey, what about Van Halen, with Eddie and Alex? Great list, and pretty comprehensive! I almost forgot about them! I'll be sure to get them added to the list. Thanks! I don't believe the Doobie Brothers are siblings. Neither are the Blues Brothers. I would have added them in a heartbeat. Great music! MARY, I don't know if they're siblings or not, but the guy on the far right, and the guy second from the left are definitely "Brothers". You taught me something today. I had no idea all of those groups were siblings. It was quite enlightening for myself as I did the research to put together the post. I always learn something, I think that's all part of the fun for me. Don't for the funky The Brothers Johnson!! George and Louis had the monster hit "Strawberry Letter 23"
oooh Good one! I just added them to the playlist. Thanks! Whoa you did a great job here regarding siblings!!!! 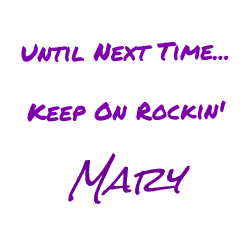 You rocked every which way but loose! hahaha I'm back from vacation and will see you on Monday possibly with some pics! Woo Hoo Have a great weekend. I've got another 'sibling' post scheduled to drop on the 26th. Looking forward to seeing what the upcoming themes will be. See you Monday!